We spent an awesome Saturday night taking photos of some of South Africa's most talented musicians performing at F*ROCK, an indoor rock festival held at Ratanga Junction. I had a really hard time choosing just one shot for the main post (we ended up with 253 photos of 8 bands, which you can see in our F*ROCK photo albums), and I even enlisted the help of my Twitter friends to help me choose at one point. 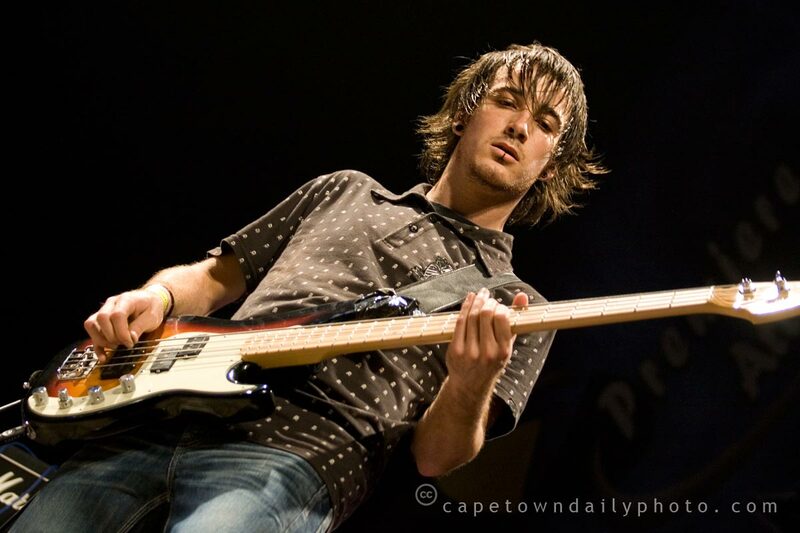 I eventually settled on this shot of Etienne Janse van Rensburg, the bass guitarist for the hugely popular CrashCarBurn. It was the first time I'd seen them perform live, and I was pretty impressed - in addition to their own original material, they played a medley of cover versions, which the crowd absolutely loved, and to make it all even more fun, they tossed out a flock of giant (no, really, GIANT) balloons for all of us to play with while they performed. Too cool for words, that was. Posted in Events and tagged concert, music, ratanga on Tuesday, 28 April, 2009 by Kerry-Anne. Well I’m seeing this post ok Paul…great angle of the photo! Thanks Beverley & jelb – the stage was fairly high up, hence the interesting angle.